Sylvester strips did publish the books below. These are big size books (37 x 29 cm) with the new 2007/2008 (Bocola) colouring. This is the first high quality reprint in the Netherlands. Somehow the frontcover design is the same as Gary Gianni's "The PV page" book (see resource chapter). 1. Prins Valiant, case-edition; numbered in case with extra print-poster. Only 100 printed, Euro 89 per book. 2. Prins Valiant, luxery (normal)-edition. Only 444 printed, Euro 59 / book. (cover is the same as edition 1). 3. 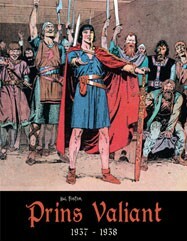 Prins Valiant, normal hardcover edition with blue lettering on cover, Euro 16,95.